One of Dawson and Kaelin's favorite activities is hide and seek. They'll hide in various places in Kaelin's room and giggle as we search for them in all the wrong places, then squeal when we finally find them. 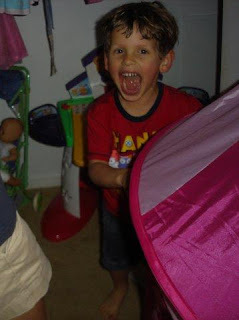 Dawson screaming after being discovered in Kaelin's tent. 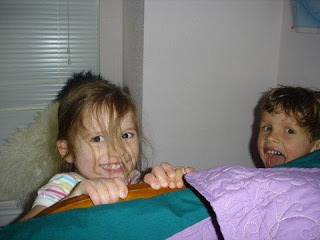 Popping up from their hiding spot behind Kaelin's bed.